(Oct 12): Singapore’s Sea initially modelled itself on Chinese internet colossus Tencent Holdings. and is often called the Tencent of Southeast Asia. Now that Sea has filed for an initial public offering and given a peak at its financials, the resemblance is starting to break down. The company, seeking to raise about US$700 million ($954.5 million) as it goes public in New York, does offer games and digital entertainment like Tencent. In fact, the Chinese company licenses hit games like League of Legends to Sea, and owns about 40% of the smaller firm’s stock. 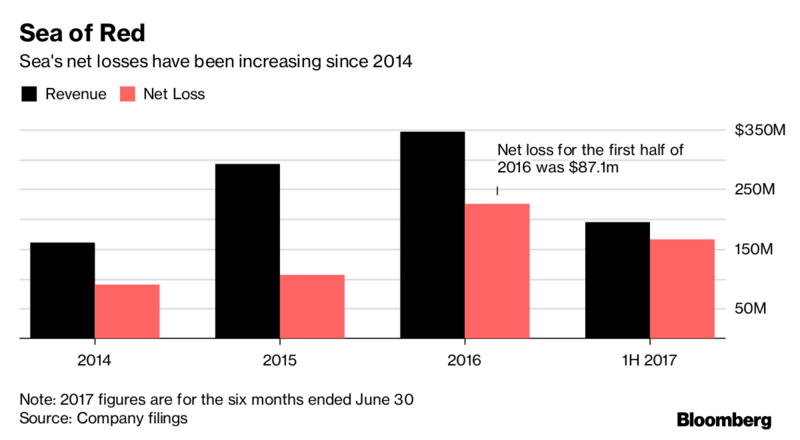 But where Tencent is immensely profitable, Sea is immensely unprofitable -- with signs that losses may grow deeper. Tencent’s net profit margin in the first half of the year was 31%, with net income of US$4.76 billion on revenue of US$15.5 billion. Sea has a negative net margin of 84%, with a loss of US$165.2 million on revenue of US$195.5 million. Of course, startups often lose money before they hammer out lucrative business models. Think Google or Facebook. But Sea is losing more money as it grows. In 2015, the company lost 37 cents for each dollar of revenue. That rose to 65 cents in 2016 and 84 cents in the first six months of this year. All that spending isn’t buying faster growth: Revenue growth slowed from more than 80% in 2015 to 17% in the first half of this year. That may make it a stretch for Sea to hit the US$4.45 billion valuation it’s seeking at the top of the IPO range, up from US$3.75 billion in its 2016 fundraising. The offering will be a test case for startups in the region looking to go public one day, including the ride-hailing service Grab. Sea was founded by Forrest Li as an online gaming company in 2009 and originally named Garena. He rebranded the company to reflect its regional ambition and diversification. Sea branched out with a digital payments service called AirPay in 2014 and the mobile shopping business Shopee in 2015. The services are similar to Alibaba Group Holding’s e-commerce platform and payments business, Alipay. Sea’s games business, which retained the Garena name, still accounts for more than 90% of total revenue. Like Tencent, the company offers games for free, then collects money when players buy virtual items like armor, weapons or special skills. It makes money in e-commerce from commissions and advertising, while collecting fees from payments. With Tencent’s support, the startup has attracted marquee backers. They include the Ontario Teachers’ Pension Plan, Malaysia’s sovereign wealth fund and several Asian billionaires. Goldman Sachs Group Inc., Morgan Stanley and Credit Suisse Group AG are leading the public offering. “You don’t buy a company like this because of its financials; you’re buying the dream of what it can become,” said Keith Pogson, global assurance leader for banking and capital markets in Hong Kong at consultant EY. The company’s market value could rise to about US$5.5 billion if options, restricted stock and convertible securities are included. Sea has ways to go before it looks anything like its role model. When Tencent went public in 2004, it had already proven it could make money: it reported net income of about US$39 million in 2003 on revenue of US$89 million. Tencent has also been able to promote its games business through messaging services with more than a billion users. Sea set up Beetalk Private. as an operating entity of its online messaging business in 2012, but it hasn’t caught on. Li is aiming to reignite Sea’s growth with its expansion in e-commerce and payments. The online gaming business that generated 92% of total revenue in the first half of this year slowed to a 12% increase in the first half of the year. The still-nascent e-commerce business is growing faster, but the firm’s sales and marketing expenses consumed 71% of total revenue. E-commerce is fiercely competitive in Southeast Asia. Alibaba acquired control of Singapore’s Lazada Group to draw more consumers in the region, while Indonesia’s Tokopedia just raised US$1.1 billion. Lazada poked fun at Sea for claiming that it’s the No. 1 e-commerce in “Greater Southeast Asia,” a far from standard term because it includes Taiwan. In the end, Sea’s prospects may depend not on how much it resembles Tencent, but how well it can work with the Chinese partner. EY’s Pogson points out the larger company could strike deals with Sea to promote its own messaging and payment services, and it could boost its stake if it wants more influence in the region. “There are plenty of opportunities for Sea and Tencent to benefit each other,” he said.